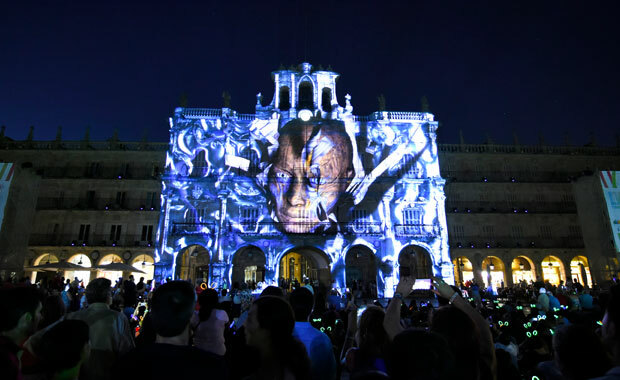 The 2018 Luz y Vanguardias festival at Salamanca has announced its international video mapping contest that will take place from the 14th to the 17th of June 2018. During those four nights, participants will project their creations on the Salamanca’s Townhall at the Plaza Mayor and will have to “play” with its baroque façade. The winner will be awarded 15,000 Euro while the runner up will receive a special prize of 5,000 Euro — sponsored by the Salamanca’s City Council. Both prizes will be decided by a professional jury formed by relevant professionals in the fields of arts, culture, image and communications. Additionally, the public will vote, at the festival’s website, for their favourite work that will receive the 3,000 Euro people’s choice award. Artists and companies willing to participate must contact the festival’s organization, via the official website or by writing an email to info@luzyvanguardias.com to obtain the competition rules and technical specifications. The winner of the international contest in the past edition of Luz y Vanguardias was the French artist Jerem Oury from Studio Echelon Mapping with Prism. The Honduran artists Heleci Ramírez and Gabriel Vallecillo Márquez won the people’s choice award with Xibalbá.